Welcome to the IBC website. The IBC is a Buddhist community offering an opportunity to study and practice Shakyamuni Buddha's teachings in daily life. We have Buddhist service in English every Sunday in a friendly atmosphere. 5/5, starting at 15:30, 4/7,14, 21, 28, 5/12,19,26,10:45 a.m. at the Birthplace of RK. The sound files of "Shakyamuni Buddha", the English version of "Oshakasama." ・We have faith in the Eternal Buddha Shakyamuni who embodies the great life-force of the universe. ・Our faith is based on the teachings of Ekayana (OneVehicle) Buddhism which includes core Buddhist teachings and the wisdom of the Lotus Sutra. ・Through the study and practice of these teachings, we recognize and respect the buddha-nature in our selvesand others. ・We follow the bodhisattva way to perfect ourselves and to bring peace to our families, communities, countries and to the world. 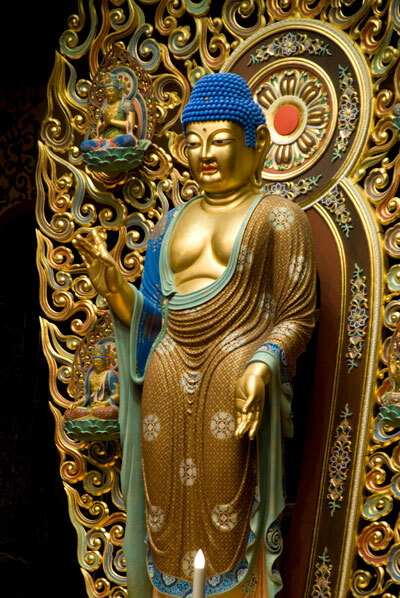 The IBC was establised in 2001 to share the Buddha's teachings (Dharma) in English with people of any nationality, especially non-Japanese living in Japan. We offer a warm Buddhist community where we can help and encourage each other to acquire the Buddha's wisdom and compassion in daily life. Everyone is welcome!